As I always remind everyone, I'm not your instructor, but I will give you all the information I have gathered over the past 18 years of flying in this lush French playground, also include many links to paragliding Annecy / Chamonix area whether it be x/c or just flying local, routes and gps waypoints, if you're interested in venturing out a bit and would enjoy having anyone interested over my place for a few BBQ's to have x/c clinics and show you x/c routes, pictures so you know what your looking for while your there. If its your first time you can go to our old blog to check out stories, pictures and the area to get an idea of the scenic backdrop you're in for. This link is covering pics of mostly Chamonix and the Passy Valley, next valley over from Chamonix when 22 Monkeys came to enjoy. Which I'm sure we will drive the one hour over to fly here at least once or twice, or better yet fly there x/c the 3 hours as the crow/paraglider flies as I was lucky to do on my last visit. Again these are older pics (2010) to introduce newer arrivals to the surroundings if interested. Do take time to pause at times to see the amazing back round scenery or the smiling faces, which are abundant! 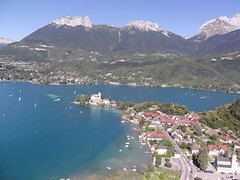 This is one of the most important links to all aspects of Lake Annecy area. Do search all links with-in this one for massive info on flying sites, weather, lodging, routes x/c and more. Bing will translate anything from French to English if you ask it to! Such a deal. For your X/C pleasure try translating this site with Bing and learn how they do it on any one of the many routes here, this is where I learned most my knowledge before I went last year. Oh so much to translate and learn here. This actually shows you pics of the thermal places, study up Monkeys! Valley winds are here, please memorize for further distance. Try turning the thermals on for your time of year for any location on the globe, this will help a bit if you study! Mad Dog et La Peste / JK & Laura / Don & Yolie / Nikki & Mikka / Tommy RD / Also possibly Scrappy? Fly to Geneva as its only less than one hour drive or bus ride to Annecy, Chamonix is not far either! Rental cars https://www.kemwel.com/car.cfm Tom Tom car GPS navigation systems are a must in your rental car so when you land you just call your buddy and give them GPS coordinates and voila they magically show up at the place/bar/neighborhood you dirted out at on your x/c mission, ( if you have enough beer to bribe them with) then you keep your radio on so when they get close you can go out to the road to meet and greet. Or if you really go far we'll talk about where to get the train to return. As far as phones, we will all buy French phone chips as we did last year in France at an SFR store to put in our phones for very cheap France calls, please do not buy English chips as this is another country and we will not be able to contact you! Jeannine will let us know about this before we get there as she is going to France 3 weeks ahead of me. I do not think you can do this online? Here we are for Annecy apartment rentals. Hints: Stay on the east side of Lake Annecy, between Annecy Ville and Doussard, but Talloires is the flying site, very close places are Talloires, Menthon St Bernard, Bluffy, Veryier Du Lac. Go to google earth and understand your surroundings and study it well. We are in a chalet in Bluffy one mile from the LZ in Talliores and Plan Fait launch is one mile above us! Perfect! Try googling any visiter center in the town or village you choose for more rentals. If you have any questions feel free to call us. Unfortunately I won't be making the trip this year. I'm sure all of you that do will have some great flying and other fun times. I still have a phone I bought last year that someone can use. You'd just have to get a new SIM card from the French cell provider that MadDog & LePeste choose. 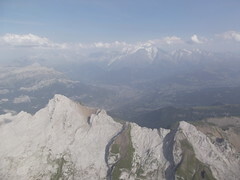 Don't count me out but I am trying to swing it last week or so of August then into September to hit Dolomites. Posbbily. St. Hilaire for the 40th. Really excited about this trip! Thanks for the post to fuel the stoke, Mad Dog. I created a blog, much like Alex has in years past. The link below the Chat Box takes you there. I listed all the links within your write up, MD. They are at the bottom right. All who showed interest so far have had an invitation sent to post on it. If anyone didn't get one, just email me and I will resend the invite. jks313(at)g-m-a-i-ldotcom. Any additional links, and I will of course be glad to add. Anything for the Dolomites out there? We may opt for that in Sept, along w/ Thom. P.S. You may be familiar with the background photo... courtesy of FlyStrong. Classic! Thanks! 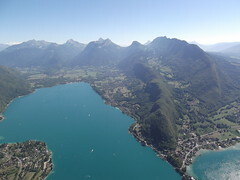 As U know our paragliding center is 15 miles away from Annecy exactly above le Bourget's lake. Aurelia N I will be there to welcome U. If any of U need anything special: let us know. We can pick U up to Geneva even fly there (Saleve). But after 30 hours of trip may a soft bed will be your first goal. Any way think U've got a monkey USHPA tandem instructor N his wife (PPG instructor) to guide U there.